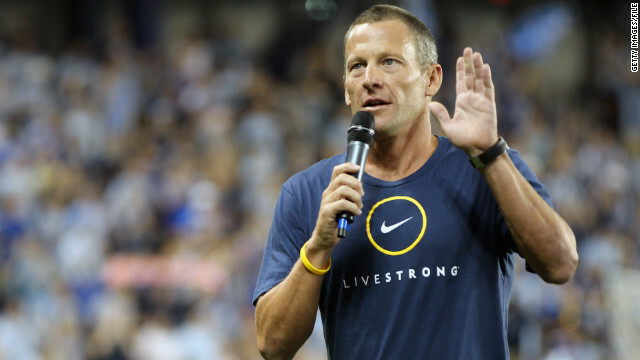 Editor's note: Controversial American cyclist Lance Armstrong is stepping down as chairman from his Livestrong cancer charity. The announcement comes a week after the U.S. Anti-Doping Agency said it had uncovered overwhelming evidence of Armstrong's involvement in a sophisticated doping program. For more information read our full story here. "We have decided not to renew our relationship with Lance Armstrong when our current contract expires at the end of 2012," Paul Chibe, Vice President of U.S. Marketing, Anheuser-Busch said in astatement. "We will continue to support the Livestrong Foundation and its cycling and running events." [Updated at 12:18 p.m. ET] Nike will take Lance Armstrong’s name off their Nike campus fitness center in Beaverton, Oregon, spokeswoman Mary Remuzz tells CNN. [Updated at 9:26 a.m. ET] While Lance Armstrong is stepping down as chairman of his charity he is remaining positive about his continued involvement with regard to helping those with cancer. "My family and I have devoted our lives to the work of the foundation and that will not change," Armstrong said. "We plan to continue our service to the foundation and the cancer community. We will remain active advocates for cancer survivors and engaged supporters of the fight against cancer. And we look forward to an exciting weekend of activities marking the 15th anniversary of the foundation's creation." "Had a great coupla days in Portland working with my great partners Nike. Awesome to see the show of support on livestrongday. 16 yrs!" he wrote. "Headed back 2 Austin now 2 celebrate with family/friends. There were days I never thought I'd see 2012. Blessed to be this side of the grass." As of this update, the status had 10,911 "likes." Armstrong's most recent tweet, from five days ago, praised the work of Livestrong. [Updated at 8:52 a.m. ET] Lance Armstrong's commitment to helping others with cancer has been a big reason the Livestrong was able to raise so much money over the years, Doug Ulman, President and CEO of the charity said in a statement. "Long before he became a household name, Lance Armstrong created a foundation to serve others facing the same fears and challenges he struggled to overcome as a result of his cancer diagnosis. Today, thanks to Lance's leadership, that foundation has had the privilege of raising close to $500 million to serve people affected by cancer. Lance has made this foundation and its cause - aiding people whose lives have been touched by this disease - his life's work. His leadership in the cancer community has spurred immeasurable progress and it has been a great privilege to work shoulder to shoulder with him on a daily basis during his chairmanship. Lance's devotion to serving others whose lives were irrevocably changed by cancer, as his was, is unsurpassable. We are incredibly proud of his record as an advocate and philanthropist and are deeply grateful that Lance and his family will continue to be actively involved with the Foundation's advocacy and service work. We look forward to celebrating 15 years of progress with Lance and his family this weekend and recommitting ourselves to the work of the cancer community for the years ahead." [Updated at 8:47 a.m. ET] Lance Armstrong is stepping down as chairman of the Livestrong charity "to spare the foundation any negative effects as a result of controversy surrounding my cycling career," according to a statement posted to the group's website. Armstrong added that he will still devote his life to the work of the foundation and remain advocates for cancer survivors. "In 1996, as my cancer treatment was drawing to an end, I created a foundation to serve people affected by cancer. It has been a great privilege to help grow it from a dream into an organization that today has served 2.5 million people and helped spur a cultural shift in how the world views cancer survivors. This organization, its mission and its supporters are incredibly dear to my heart. I am deeply grateful to the people of the foundation who have done such hard and excellent work over the last 15 years, building tangible and effective ways to improve the lives of cancer survivors. And I am deeply humbled by the support our foundation has received from so many people throughout the world - survivors, world leaders, business leaders and of course, the cancer community itself. We turn to this community frequently for guidance and collaboration to achieve our shared goals. They are unfailingly generous with their wisdom and counsel and I can never thank them enough. My duties will transfer to Vice Chairman Jeff Garvey who will serve as chairman. Jeff's guidance and wisdom have been critical to shaping the foundation's work since its earliest days. Jeff was this organization's founding chairman and I have full confidence that under his leadership, the foundation will continue expanding its ability to serve cancer survivors. My family and I have devoted our lives to the work of the foundation and that will not change. We plan to continue our service to the foundation and the cancer community. We will remain active advocates for cancer survivors and engaged supporters of the fight against cancer. And we look forward to an exciting weekend of activities marking the 15th anniversary of the foundation's creation." [Updated at 8:22 a.m. ET] Nike has just released a statement saying they have terminated their contract with Lance Armstrong for misleading them for more than a decade. "Due to the seemingly insurmountable evidence that Lance Armstrong participated in doping and misled Nike for more than a decade, it is with great sadness that we have terminated our contract with him. Nike does not condone the use of illegal performance enhancing drugs in any manner," the statement on Nike's website reads. "Nike plans to continue support of the Livestrong initiatives created to unite, inspire and empower people affected by cancer. [Posted at 8:12 a.m. ET] Controversial American cyclist Lance Armstrong is stepping down as chairman of his Livestrong charity, which was set up to "fight to improve the lives of people affected by cancer." The move comes a week after the U.S. Anti-Doping Agency said it had uncovered overwhelming evidence of Armstrong's involvement in a sophisticated doping program while a professional cyclist. Armstrong found out he had testicular cancer at age 25 when he was emerging as a rising star among cyclists. He started a small group to raise money for cancer called the Lance Armstrong Foundation in 1997. 84 million bright yellow Livestrong wristbands have been distributed since 2004. In the wake of the doping scandal critics have struck out the "V" in the bracelet to make it read what they accuse Armstrong of doing for more than a decade: "LIE STRONG." Too bad, he has done a lot to raise money to fight cancer. look in to his foundation. it takes money and tells people that lance is great. it does not help anyone with cancer, or help pay for research. it's a scam, just like lance. Armstrong is the greatest cyclist in American history. Greatest cyclist? We'll never know. Because we'll never know how he would have performed unenhanced. And you think that Dubya was the greatest president in American history, too, I am sure. His efforts to beat cancer and the lives he saved not up for debate, he needs to look in the mirror and decide what he did as a athlete is not only repugnant but totally dishonest, integrity in tatters and his bullying was really unpalatable, hope he finds the strength to come clean as the strength he found not only to beat his disease but for those of others... your legacy and sport require honesty Lance. Rather than stepping down Lance should be stepping up against use of drugs. He should set an example. Totally agree... I hate to admit it (he inspired me many times while on and off the bike) that he lied so much, for so many years. Now he needs to get back in front and talk about why he did what he did (I think for the primal winning & money...) and how HE can make a difference. Might be a few years too late though... He STILL is one if not the best cyclist ever! Unfortunately he'll probably never come clean, because the moment he does he would drown in a sea of perjury charges and civil lawsuits. Sad, sad day. regardless of how you feel about the allegations, he sure did alot for the cancer comunity. All that support and help will now be gone. I don't think so, if this had happened at the inception of Livestrong of course it would never have gotten off the ground. But at this point it can definitely be argued that what the organization itself does is bigger than Lance and can continue without the direct association of having him acting as the chairman. That's not to say that donations may not diminish, but Livestrong isn't going to vanish overnight. All that cancer crap is just a facade, a smoke screen. The foundation, indeed, all of his "charitable" activities, all of his activities period- heck, his entire life- are about one thing and one thing only- Lance. And he got cancer because he was doping and juicing. What a "dope" (and no pardon for the pun). I hope that sob Tagart is happy with the outcome of his politically motivated 14 year old witch hunt. Will he ever apologize to the sport he's helped condemn or the cancer patients that Armstrong tried so hard to help in spite of the politics? Not. And I don't even want to think about the trampling of due process. I implore each of you reading this post to contact your U.S. representatives to request the the agency be restructured to comply with U.S. law. You can only fight politics with politics. You have a point. I believe this is all a witch-hunt and I hope to goodness that the perpetrators are eventually brought to book for destroying a legend. The US federal court has already ruled that USADA did nothing and that Lance received due process. The organization does comply with US law and is a required element of our participation in the Olympics. I (an ex-cyclist) have changed my views on Lance. The baramoter to me shifted when I read Dave Z's affidavit and started pulling together the perspective that Lance was really requireing the doping by the other riders as a condition of being on US Postal and to further his own goals. There is a line in there that was crossed between user and pusher and for that and all his bullying tactics, he is the trash he is. Your "legend" destroyed himself. But it's worth remembering that "legends" are a mixture of truth and lies. Well, at least you're not bitter about it. Jayde that legend destroyed himself. Get over and root for those hardworking cyclist who came in second and were clean while Lance beat them and took away their $$, fame, trophies and glory. I honestly feel that Lance Armstong has done SO much more good than "evil". He made a really bad decision, but this man's dedication to Cancer awareness, and fundraising should far overshadow all these headlines. He's been (rightly) stripped of his glory- publicly humiliated – so enough- how much longer does he "deserve" to be punished. Let him run his foundation and we all need to "get over it!" and let him figure it all out. I will always support "LIVESTRONG"
this is a sports issue, if anything any charities he's done should be inconsequential to the fact that he blatantly lied to millions for years on a level few liars ever have, and cheated to achieve what he did. Its sad and embarrassing some of you refuse to acknowledge that reality. Who's to say the drugs he was taking, didn't have some effect on his cancer? I am a cancer survivor, and I just can't get past that one fact, it is very possible that these drugs directly, or indirectly caused his illness to begin with? I don't think that anyone is "refusing to acknowledge that reality" at all- he did it- he finally admitted it- it's disappointing- it's sad- it's done- get over it- it's not up to us to condemn him- I would actually (hopefully) never find myself judging another person- that's not our job- is it?? Enough- put it to rest..
Good Luck. Livestrong is going down like a tank. What a joke. Can you tie your own shoes, or walk and chew gum at the same time? Why is it a shame for a shallow, self-absorbed fraud to step down from a position with just one purpose- to glorify himself? Whole situation is sad – but cycling nor Lance Armstrong is high priority on the list of problems of my life or of this country. I'm really tired of the news headlines about this. It's just not that important to me. None of us are perfect. In my opinion – even if he is guilty – the good he has done far outweighs any bad. So – good luck with the rest of your life Mr. Armstrong. He is an accomplished individual with more life achievements than 99.9% of the rest of the population. It's a shame he had to go down in FLAMES like this. LIE STRONG!!! Lance and I went through Cancer at the same time. I don't give a crap what he took. Does anyone want to go through what he did to get to the top. He should be dead and because of his strength and belief he beat Satan and his chemo. It's a shame how America has turned on him. People forget how he inspired people all over the world stricken by this terrible disease to never give up. God Bless both of you and keep up the good fight. Bobby, truly sorry about your bout with cancer. My stepmother is in a battle with it now. Hope you won that battle as well. But I have to disagree with you that this guy should be looked up to. He made millions on a lie...and has deeply hurt his cause be refusing to fess up. He's no role model. You can't cheat, lie and steal (other people's chances to fairly win) with one hand and hand out flowers with the other and expect my support. There are better people and ways to fight cancer than Lier Lance. Don't dishonor your struggle and resultant victory by equating yourself with this egomaniacal clown. His contributions to cancer research will be his legacy. Yes, it's sad that he used performance enhancing drugs but the lives he will save through the foundation ae something to be proud of. Please provide the name of at least one individual whose life was saved by the foundation, as a means of validating the accuracy of your post. completely untrue. livestrong is a scam, a non-profit PR firm for lance. People need to relax, all of the good things he has done for the fight against cancer far outweigh anything else. Take a step back and look at your own lives first before slandering someone else. see where the foundation spends it's money. no research, no direct involvement in patients, nothing, it spends it's money telling people lance is really a good guy. in other words, a scam.